A laparoscopic adjustable gastric band, commonly referred to as a lap band, is an inflatable silicone device placed around the top portion of the stomach to treat obesity by reducing the amount of food consumed. Adjustable gastric band surgery is an example of bariatric surgery designed for obese patients with a body mass index (BMI) of 40 or greater—or between 35–40 in cases of patients with certain comorbidities that are known to improve with weight loss, such as sleep apnea, diabetes, osteoarthritis, GERD, Hypertension (high blood pressure), or metabolic syndrome, among others. In February 2011 the U.S. Food and Drug Administration (FDA) expanded approval of Adjustable gastric band to patients with a BMI between 30 to 40 and one weight-related medical condition such as diabetes or high blood pressure. However, an adjustable gastric band may only be used after other methods such as diet and exercise have previously been tried. The inflatable band is placed around the upper part of the stomach to create a smaller stomach pouch. This restricts the amount of food that can be consumed at one time and increases the time taken for the stomach to empty. The patient achieves sustained weight loss by limiting food intake, reducing appetite, and slowing digestion. However, gastric banding is the least invasive surgery of its kind. 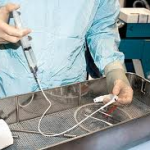 Gastric banding is performed using laparoscopic surgery and usually results in a shorter hospital stay, faster recovery, smaller scars, and less pain than open surgical procedures. Because no part of the stomach is stapled or removed, and the patient’s intestines are not re-routed, he or she can continue to absorb nutrients from food normally. Gastric bands are made entirely of biocompatible materials, so they are able to stay in the patient’s body without causing harm. 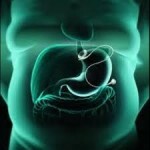 The surgical insertion of an adjustable gastric band is often referred to as a lap band procedure. First, a small incision (typically less than 1.25 cm or 0.5 in.) is made near the belly button. Carbon dioxide (a gas that occurs naturally in the body) is introduced into the abdomen to create a work space for the surgeon. Then a small laparoscopic camera is placed through the incision into the abdomen. The camera sends a picture of the stomach and abdominal cavity to a video monitor. It gives the surgeon a good view of the key structures in the abdominal cavity. A few additional, small incisions are made in the abdomen. The surgeon watches the video monitor and works through these small incisions using instruments with long handles to complete the procedure. The surgeon creates a small, circular tunnel behind the stomach, inserts the gastric band through the tunnel, and locks the band around the stomach. As patients lose weight, their bands will need adjustments, or “fills,” to ensure comfort and effectiveness. The gastric band is adjusted by introducing a saline solution into a small access port placed just under the skin. A specialized non-coring needle is used to avoid damage to the port membrane and prevent leakage. There are many port designs (such as high profile and low profile), and they may be placed in varying positions based on the surgeon’s preference, but are always attached (through sutures, staples, or another method) to the muscle wall in and around the diaphragm.